You know what the worst part about organizing something is? Other than the fact that it constantly needs to be done (which is really the worst part) the biggest challenges in organizing is that it makes a huge mess. It just doesn’t seem to make sense. All that stuff that fits in your closet right now, or at least mostly fits, has to come out so you can start fresh, take stock of what you have, decide what to keep, and put it back in a better order than it was before. I’ve often used this analogy when talking about repentance. When you’re trying to organize and remodel your life the mess always gets bigger before it gets better. The other day I realized that not only does this describe repentance, but it describes our entire earth life. We are in the messy phase in the closet cleaning of our eternal lives. Heavenly Father sent us to Earth to “Go clean your room!” (I’m pretty sure it went something like that.) The inventory of our choices is available before us, and we are currently deciding what we will put back into our closets. We evaluate each of our traits, talents and characteristics and decide whether to keep or to toss. I hope to keep kindness, humility, and inquisitiveness. In my discard pile is pride, doubt and anger. Sometimes, just like that article of clothing that you love that you no longer wear because it doesn’t fit, or because you’re going to fix it “someday”, or it is worn out, we want to hang onto our favorite traits even though we know we shouldn’t. When we get too attached to the things we should give up it can be hard. 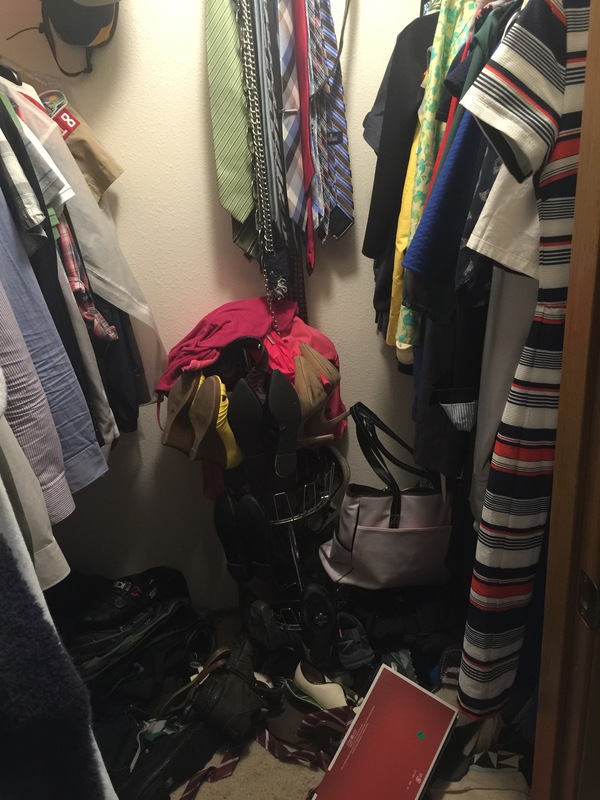 When we are honest with ourselves we can see it has no place in our new and improved closet, and we have been given access to a professional closet organizer, Jesus Christ, who wants to help. He knows how best to help you create order out of the mess. If we get focused on the mess and forget the purpose of it we can begin to feel uncomfortable. We begin to worry that other people are judging us by the size or content of our mess. Just keep in mind that this mess is productive. Your mess is not indicative of your abilities as a spiritual housekeeper. Some people have bigger messes to clean than others, but what matters in the end is not what we get rid of or the amount that we need to get rid of, but what we choose to keep. When Heavenly Father comes to check our work on judgement day, I sincerely hope that I’ve taken the advice and help of our professional organizer and I have done my work. I want to live with Him forever with all my heart, but first, I have to finish cleaning. My hardest thing is the struggle with control. I think I can keep things in my closet and control them so they are ok, when what I really need to do is hand it all over the the Lord and let Him help me.